Tarazed's Many Hobbies: What blanket? Well, I knew it had to happen, I got distracted from the blanket by a wily sock. But this was kind of planned, because by the time I start block 5 of the blanket, I'm going to need a longer needle. So I ordered a 5.5 mm 60" ChiaoGoo needle, and am waiting for it to show up before I get really working on the blanket again, though I will take it to the in-laws (common-law in-laws, but easier to type), to finish block 4 over the Christmas holiday. The wily sock is almost finished the gusset, which for me is pretty darn quick, since I started it last Friday, the 16th. It's a blatant rip-off of a friend's sock, momo. I just fell in love with hers and it wouldn't get out of my head. 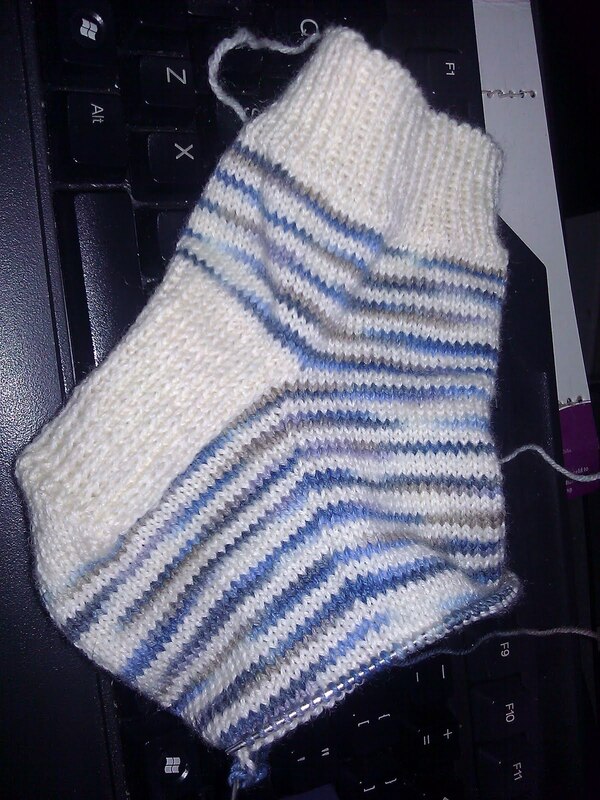 I'm using Regia 4-ply Color 5030, silt, in 2-row stripes with plain white. 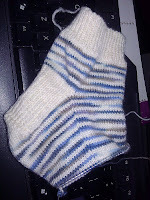 I hope to finish the sock over the weekend as well, and possibly have a pair before the end of the year. If it does go over, it'll certainly be done by the week after. I think I've finally figured out a formula for my socks. On 2 mm needles like this one, I need 80 stitches, in Regia 4-ply I'm getting 10.5 stitches to the inch. My feet are 9" around, so it should work. For each needle size up or down from 2 mm, I'll add or subtract 4 stitches. I hope to knit a few pairs over the next couple of months to see how this works out. Standard flap heel, though I may try the sweet tomato heel as well.